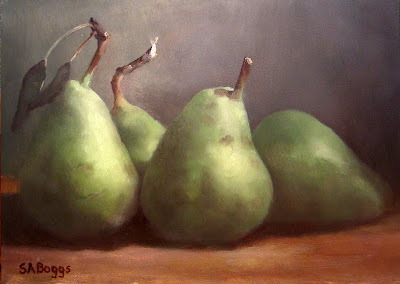 These pears are from one of my mother in-law's pear trees. I took them from the tree yesterday afternoon to paint them. I wanted to get a jump on them because most of them somehow disappear from the tree as they start to ripen. For this painting I was most interested in the lighting and the really neat looking stems and leaves. I hope that you enjoy the painting!